ICD has successfully launched a new project called ‘Culture on a Plate’, the main goal of which is to provide a guide or map of a large variety of food culture available in Berlin. The guide aims to provide a comprehensive guide to the most prominent restaurants in Berlin, which represent every country of the world. We first had the pleasure of experiencing a variety of fresh, exotic food from Ghana, which was prepared by the owner of African Kingdom. The food was distinguished by its unique flavour stemming from freshly imported produce from Ghana. However before we share our experience with you, let us first learn something about the culture of Ghanian food. 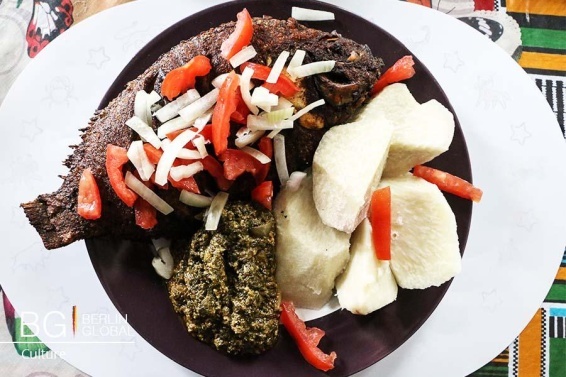 Ghanaians enjoy simple, flavoursome cuisine. The majority of meals consist of thick, well-seasoned stews, which are usually accompanied by side dishes like that of rice or boiled yams. Stews come in a variety of flavours, the most popular being okra, fish, bean leaf or other green vegetables. Others include a fishy tomato stew, spinach stew with either fish or chicken or groundnut peanut which is one of the countries national dishes. Many spices are used to prepare the stews and other popular dishes. Cayenne, allspice, curry, ginger, garlic, onions and chilli peppers are the most widely used seasonings. Onions and chili peppers along with tomatoes, palm nuts, and broth help to make up the basis for most stews. African Kingdom is a bar and restaurant offering delicious Ghanian food, drinks and music. In the African Kingdom one can find culinary delights from Ghana, which are freshly prepared in a family kitchen with love. You can expect delicious, traditional and spicy food which is part of the Ghanian food culture .They also cook vegetarian food. With a large and rich selection, one will surely find something to their liking. 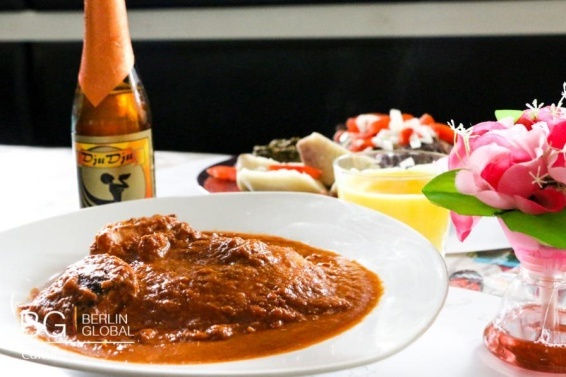 In addition, the restaurant offers a huge variety of traditional Ghanian drinks like Asaana to try. The ICD team went to visit the African Kingdom on the 24th of May 2016 and the chef recommended two traditional dishes to us. Tilapia fish: Tilapia is served with boiled Ghanian potatoes and Spinach. To prepare the fish one needs garlic, onions and herbal leafs. For the sautéed spinach, egg, spinach and red oil are needed. Cooked Yam in stew: A large chicken weighing approximately 3kg is required in order to obtain the strong meat flavor synonymous with this dish. The chicken is put in a stew, with foreign pepper without using any sugar. To accompany our food, we were served traditional refreshing beer from Africa. The beer came in a variety of flavours including banana, mango and pineapple. The beer was very fruity and contained only a small percentage of alcohol. In our opinions our experience at the African Kingdom was absolutely outstanding. Not only was the service phenomenal and personable, the food was also incredibly tasty and unique. We would strongly recommend this restaurant to anyone who is keen to experience traditional Ghanian food in Berlin. Private events like birthday parties can be organized.